The Chicago Manual of Style, 16th Edition 16 Edition The Sixteenth Edition is available in book form and as a subscription website. 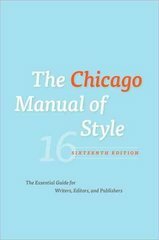 The same content from The Chicago Manual of Style is in both versions.While digital technologies have revolutionized the publishing world in the twenty-first century, one thing still remains true: The Chicago Manual of Style is the authoritative, trusted source that writers, editors, and publishers turn to for guidance on style and process. For the sixteenth edition, every aspect of coverage has been reconsidered to reflect how publishing professionals work today. Though processes may change, the Manual continues to offer the clear, well-considered style and usage advice it has for more than a century.The sixteenth edition offers expanded information on producing electronic publications, including web-based content and e-books. An updated appendix on production and digital technology demystifies the process of electronic workflow and offers a primer on the use of XML markup, and a revised glossary includes a host of terms associated with electronic as well as print publishing. The Chicago system of documentation has been streamlined and adapted for a variety of online and digital sources. Figures and tables are updated throughout the book—including a return to the Manual’s popular hyphenation table and new, comprehensive listings of Unicode numbers for special characters.With the wisdom of a hundred years of editorial practice and a wealth of industry expertise from both Chicago’s staff and an advisory board of publishing professionals, The Chicago Manual of Style, 16th edition, is an invaluable resource in this rapidly changing world. If you work with words—no matter what the delivery medium—this is the one reference you simply must have.